Squeah was, until the early sixties, just another mountain across the river. Then, in 1960, Menno H. Epp, leading a delegation from the British Columbia Mennonite Youth Organization went into the Yale district looking for a possible children’s camp site. After considerable searching and much deliberation, the site, then known as Lincoln Park, was agreed upon as a suitable location, and in the fall of 1961, what eventually would become Camp Squeah was purchased by the BCMYO. 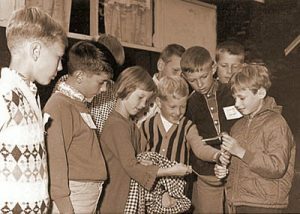 The early developmental stages of the camp included a General Conference Mennonite work camp in 1962, which involved contributing efforts from Mennonites from areas across North America. The camp developed and grew to the point where eventually, in 1967, the parent body of the BCMYO, namely the Conference of the United Mennonite Churches of BC, now Mennonite Church British Columbia, assumed responsibility for the camp. Camp Squeah property boasts a rich history. This property, which extends to the Fraser River, became the unloading area for prospectors and business men in the gold rush days. In 1881 the first locomotive to BC came up by steamer and was unloaded at a wharf which was at the river’s edge of what is now Squeah property. Emory Creek Co-op, a resort area adjacent to Camp Squeah, was once a town of 15,000 people, but with the coming of the railroad, the town died. Mrs. McPherson, daughter of the first known owners, Mr. and Mrs. J.H. Simpson, reports that at one time 400 camels had been imported from Arizona. These were also unloaded at Emory Creek wharf from where they then transported supplies for the prospectors. She reports that because of the camel smell, the horses died and the camels had to be withdrawn from the venture. They were turned loose, and camels were seen in the Kamloops area as late as 1912. In the 1930’s, after defecting from the Buffalo Bill Circus, Carl Zofka hid in the mountains behind the property and to his astonishment, discovered nickel. This discovery prompted the construction of horse stables on the property for the hundreds of horses which would pack supplies to the first nickel mine in BC. The previous owners tell us that the hiking trails used today were originally created by pack horses. To attract American tourists, the property was developed into an autocourt and named Lincoln Park. It was actually the desire of the Simpsons not to have the property commercialized. Rather they had intentions of turning it over to the government to be used as a park, but due to illness, they were unable to see their wishes fulfilled. Friends and relatives of the Simpsons were thrilled to see the Simpson’s dream realized forty years later. The property was purchased from Mr. and Mrs. Martin Strange in 1961 to be used as a camp where children could learn about God in a natural setting. After initial development in 1962, the camp was renamed Camp Squeah, and this ‘place of refuge’ was dedicated on July 1, 1962.